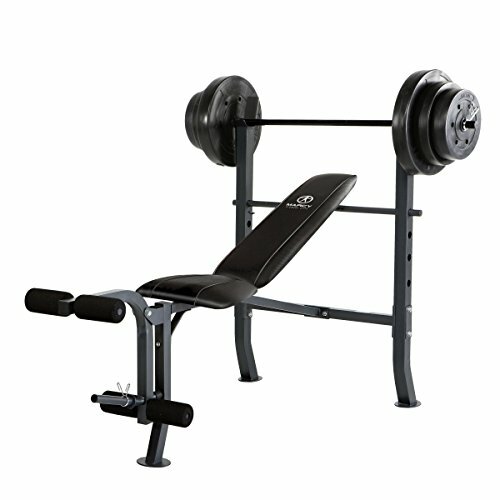 Burn calories and lose weight with the MD-2082W Marcy Standard Bench. It is designed to accept standard and mid-size barbells to help you define and tone your muscles as well as strengthen them. The bench features a multi-position back pad that is adjustable to five positions for flat chest presses and to three positions for incline exercises. The Marcy weight bench is excellent for lower body workouts with the total leg developer that targets your glute, hamstring and quadricep muscle groups. With its heavy-duty steel tube frame construction, it can support up to 300 total lbs. for regular workouts.